More than a dozen men have been arrested in Pakistan for the death of a teenage girl whose body was found in a burned-out van. The killing in the village of Makol, near Abbottabad, rocked Pakistan when it emerged that about two dozen men had held a council and decided on the murder as a form of honor killing. When local residents finally managed to put out the flames that had engulfed several vehicles April 29, they found the charred body in the back seat of one of the vans. Police said the body was that of Ambreen Riasat, a local teenager whose supposed crime had been to help a friend elope. “The thinking was that they would create such a precedent that no girl would dare run away again, and no boy would dare lure a girl away, and no car owner would help such a couple," police officer Naseer Ahmed. Police said Ambreen was killed before the car was set on fire, but a neighbor said he heard her shouting for help while the car was burning. 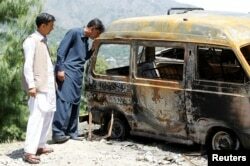 People look at the van in which Ambreen Riasat was burned in the village of Makol outside Abbottabad, Pakistan, May 6, 2016. Fourteen suspects are in custody -- all of them are related to another girl who had eloped in mid April with a boy from another family. Police said the the men taken into custody had decided to punish Ambreen for her role in the elopement. Ambreen’s father recalls his horror as he learned the details from police and the media. “I’m like a dead man. My home is destroyed. If I knew who did it I would have destroyed them too and then called the police," Riasat Khan said. To add to the tragedy, police have also arrested Ambreen’s mother for obstruction of justice. They claim she knew that Ambreen had been taken but refused to tell them. She denies knowledge of how her daughter disappeared. The families of the accused said they are innocent. Ihsan Muhammad Khan of VOA Deewa contributed to this report.